Eleven years ago I was fortunate to get a ticket for the Longfield Road Lake. The lake held a phenomenal stock of fish. I’d read the books by Terry Hearn and Nigel sharp on their exploits at this tricky little lake, various articles in magazines with photos of the stock all made the fishing at this lake the more special. On a good run from my home in Nottingham it took me over two hours to get there but after closing the gates to the lake and parking my car I felt truly blessed to be given the opportunity to fish here. 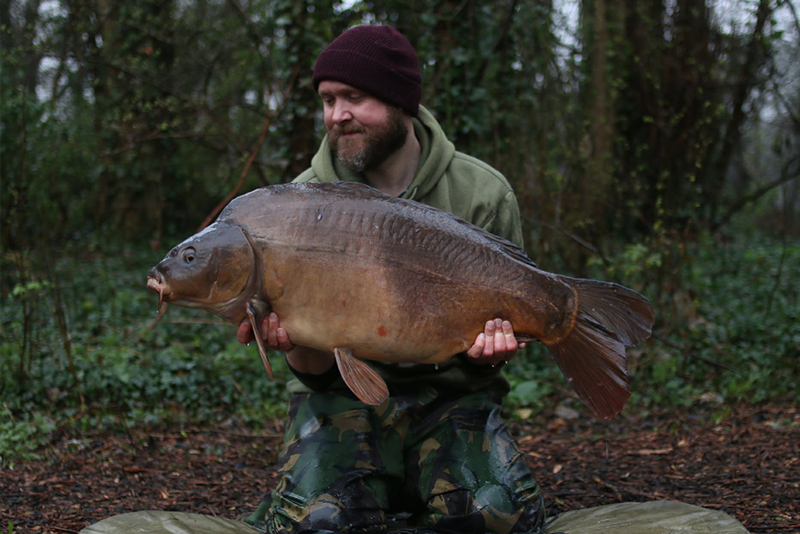 At around three acres in size and nestled in the Colne Valley the lake was special. Three particular fish really got me excited, 'Clover' the biggest in the lake, the mighty 'Big Lin' and a fish with a noticeable 'Orange Spot' fired up my enthusiasm to angle here. A year later the road lake suffered a fish kill with the majority of the stock dying, 'Clover', 'the Dink', the 'Big Lin', the 'Scattered', all victims of this very sad event. Months later I got to hear the fantastic news that a few of the stock had survived, some of the A team were still swimming around in the road lake including 'Three Scales', the missing 'Starburst', the pretty one but most importantly to me the 'Orange Spot'. On texting Rob Barrage the head bailiff, I was told a waiting list was in place so I put my name down and expected a long wait. News of 'Orange Spot' getting caught at over 40lb and seeing the photos had me wanting desperately to get back to the road lake. Three years ago the new owners decided to allow a few fortunate people to have a go at the road lake on a winter ticket, a tricky venue in the warmer months so I knew I was up against it in the colder months. Over the coarse of two years I was fortunate to catch a few of the up and coming stockies including a capture of two of the originals, 'the Pretty One' and a very special capture of 'Three scales'. My dear friend Derek Rance who sadly is no longer with us had caught this very old carp so this capture meant everything to me and brought back very fond memories of my departed friend. 2017 I took up the opportunity of fish the full season on the road lake, I wouldn’t leave until the 'Orange Spot' graced my net. I fished regularly in the reeds and bars swim over the coarse of the season as I’d done before and though 'the Spot' had been caught from these swims there was one swim that had had real good end of season form. 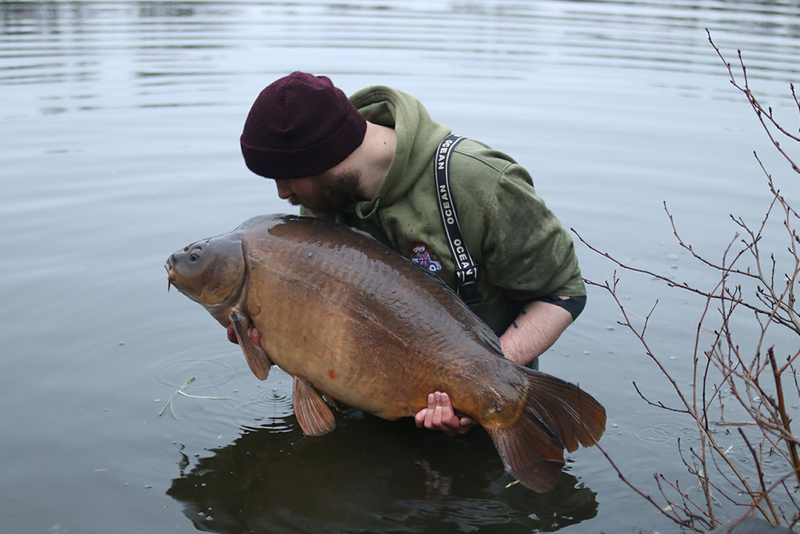 My good friend Baz from Kent who’d since left the road lake a few years previous was always in contact with me on how I was getting on, he told me I had to fish in the No.1 swim religiously. He knew I wasn’t a fan of this swim but he believed this would be my best opportunity to catch her if I continually fished it, baited it and kept going in there whenever I could. Over the coarse of weeks I fished in the No.1 swim applying various amounts of Trent baits Shrimp boilies and pellets to a few chosen spots. 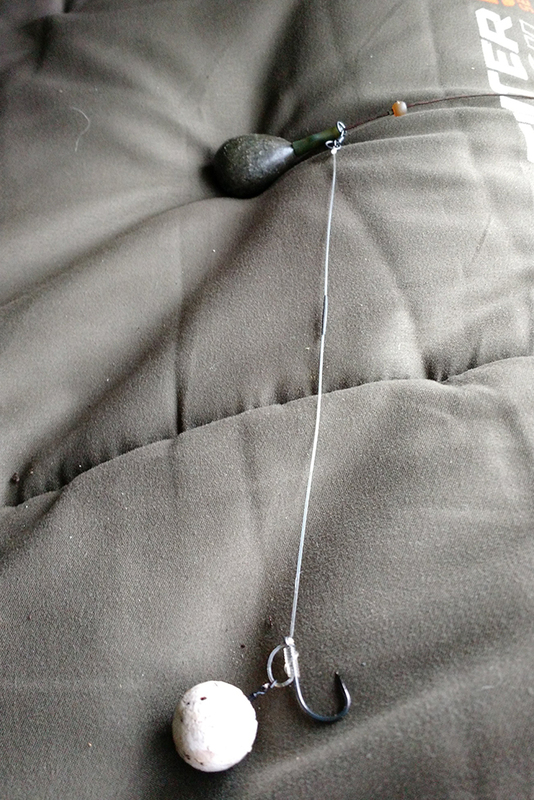 I noticed that the spots were getting fed on by the firmer drops I was getting on the leads. Liners would have me leaping out to the rods but no bites were forthcoming. 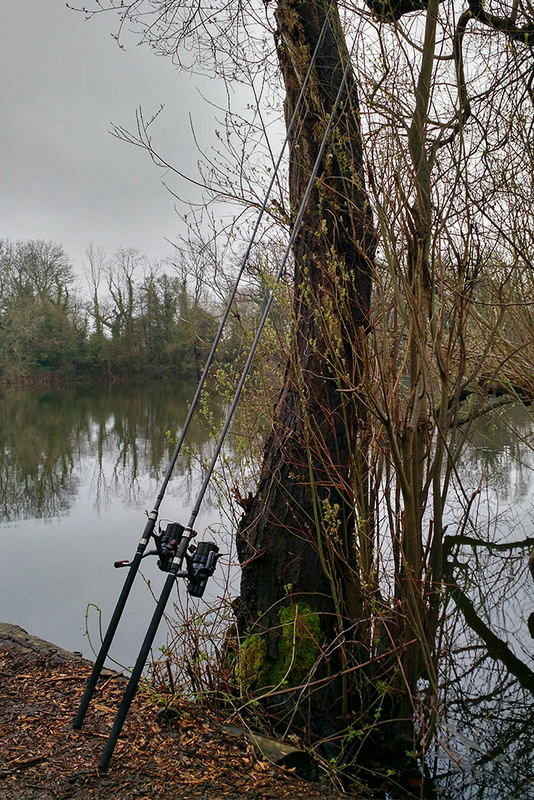 The 9th of April I was once again set up in the No.1 swim, rigs gently flicked out to my usual spots along the tree line, shrimp white wafters with an ESP size 5 hook balancing out the bait and a few Trent baits shrimp boilies around each rig completed the now regular pattern. Water clarity was poor but having a look along by the snags I saw a few dark shapes, but was 'The Orange Spot' there? A constant light drizzle of rain fell as I sat under my brolly, copious amounts of tea and continually watching the water had me finally drifting off to sleep. At 0230am I had a fast take, rods locked up I was on the rod in a flash I applied slow steady pressure to the fish that woke me from my sleep. The fish hugged the tree line and fought steadily for over fifteen minutes, if I’m honest it didn’t feel like a big fish but this fish was reluctant to be netted. Finally after a bit of coaxing the fish kissed the spreader block and I lifted the folds of the net around my prize. Head torch on I could see it was a proper one, wide and length telling me it could only be one of the four fish. Within seconds of looking down into the net I felt a massive adrenaline rush and felt quite emotional because there sitting in my net was 'the Orange Spot'. With her Safely secured I sat back on my bed, kettle on, the absolute joy and relief was immense. The first person I had to contact was Baz...a missed call to his phone was all I had to do at 0300 in the morning for him to know I’d caught her. After a few texts a few of the road lake regulars gathered for the photos. I lifted her up to the cameras and she looked magnificent, the huge smile across my face was constant as my friends snapped away. I got in the lake for a few water shots, a kiss and orange spot swam away. I know that morning my dad was with me in spirit. I'm sure my dad was looking down on me and raising a glass of his favourite whiskey toasting my longest quest of success in catching my obsession. Long live the road lake and the spot.... a very special lake and a very special fish. ← Nathan Highley bags a personal best!